A new video game has been launched by Hezbollah Cyber Media Unit department simulating the protagonists' fight against the terrorist groups in Syria that have mainly become known as Daesh [Arabic acronym for "ISIS" / "ISIL"]. This is not the first time the group launches such a game. Hezbollah released its first video game in 2000, with "Quds Kid", followed by "Special Force I", after "Israel's" retreat from Southern Lebanon, and "Special Force II", based on the 2006 "Israeli" war on Lebanon. 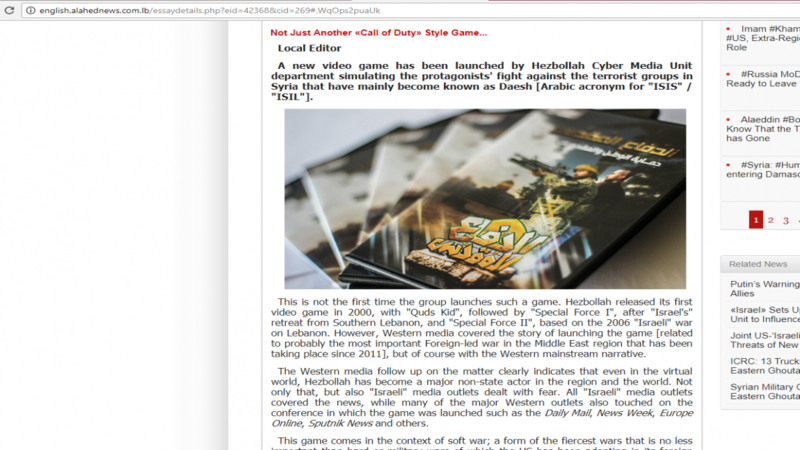 However, Western media covered the story of launching the game [related to probably the most important Foreign-led war in the Middle East region that has been taking place since 2011], but of course with the Western mainstream narrative. The Western media follow up on the matter clearly indicates that even in the virtual world, Hezbollah has become a major non-state actor in the region and the world. Not only that, but also "Israeli" media outlets dealt with fear. All "Israeli" media outlets covered the news, while many of the major Western outlets also touched on the conference in which the game was launched such as the Daily Mail, News Week, Europe Online, Sputnik News and others. This game comes in the context of soft war; a form of the fiercest wars that is no less important than hard or military wars of which the US has been adopting in its foreign policy in an attempt to destroy the cultures and values of "the Other". The game exemplifies a series of battles in which the resistance party of Lebanon participated, starting with the defense of the shrine of Zeinab, the granddaughter of Islam's prophet Mohamad [PBUH] in Damascus all the way to the battles protecting the Lebanese-Syrian border in Ras Baalbek and other battles inside Lebanon's Arsal which turned out to be a big win for Hezbollah and the Lebanese people in face of terrorism. To envisage the game here is a further short description. The game begins with the visit of Ahmad to the shrine of Sayyida Zeinab. The holy shrine comes under attacks by the takfiri groups of Daesh that push Ahmad to join Hezbollah Resistance fighters in order to defend the religious sanctities. The game is based on real events and facts that have occurred over the past few years. High-quality image accurately shows landmarks similar to those areas, roundabouts, schools and homes, such as the Hejira Roundabout, Shehade School in Hejira and others. The game developed within a time frame of two years and is a first-person shooter video game, has a few goals including entertainment and suspense, demonstrating the core idea of the cause, stimulate the sense of responsibility by broaching the crimes committed by the Wahhabi-fed groups who haphazardly killed people of all backgrounds and ethnicities, as well as to visually and interactively document the victory over the terrorist groups who have been backed by the US, Saudi Arabia, "Israel" and other countries. This is what the DVD description reads "this is a tool to confront the violent culture which invades our markets through games devoid of sentiment or sense of belonging". Now back to media outlets that have covered the story but of course with not a few but many misconceptions, most important of which is the nature of the game, its goals and aims and the fact that the takfirist Hezbollah has been fighting are not believed to be "Sunni Muslims" but rather misusers of the name of Islam. In an article published on the 28th of February, The Tech Times described the game in an article as a "Call of Duty style game". However, this is not just another video game like the American Call of Duty, Counter Strike, Delta Force or other. The Holy Defense game is actually a simulation of the real events taking place in Syria, of the real intention behind Hezbollah fighting there which in first place is to defend holy religious sites and defend Lebanon's territory. The game is also a simulation of the violent culture being harbored by the US, "Israel" and their allies; the culture of takfiri terrorists. Here I touch on the term Takfiri; the News Week wrote in an article it published on the matter that the term "Takfiri describes a Muslim who considers other sects of Islam to be forms of apostasy and is often used by Shiite Muslim groups such as Hezbollah and its allies to describe hardline Sunni Muslim organizations like ISIS." However, it is not a matter of Shia and Sunni sects. When people use the word Takfiri, coming originally from the word "blasphemy", they mean a person or group of people who exploit the name of Islam to kill not only Muslims from other sects but also all people from different religions and backgrounds who do not share their ideology and convictions. These groups are fed by the school of Wahhabism, which is mainly taught by Saudi Arabia again through exploiting the name of Islam which is a peaceful religion. Many of these takfiris who fought alongside the al-Qaeda affiliated groups in Syria and Iraq are returning to Europe and the West where they were recruited in first place through Saudis, Qataris and others and have come back home to roost. Meanwhile, the Middle East Eye tried to describe the Hezbollah fight against the terrorist groups as an Iranian-backed ‘militia' fight, but failed to point out that the group became active in the war with the consent of the Syrian government and also after real threats to religious sanctities inside Syria, threats inside Lebanon with the waves of suicide bombers attacking Lebanon and the threats intimidating Lebanon and its borders. For an American who is not aware of the real war in Syria, the US and its allies have been supporting these takfiri groups linked to al-Qaeda in face of the Syrian legitimate government that was elected by the Syrian people. For an American for instance, a similar case might be this: America's adversaries supporting the KKK, funding and arming the Klan to attack and bomb the USA's cities and killing its people. In light of the Western media blackout in general and the American media blackout in specific, the game is another attempt to inform people who know nothing about the Middle East and its whereabouts the real situation in Syria in an interactive manner.